Condos are fairly rare in the Seattle area’s housing market. Some who might opt for a condo wind up competing for more prevalent single-family homes, driving prices higher. 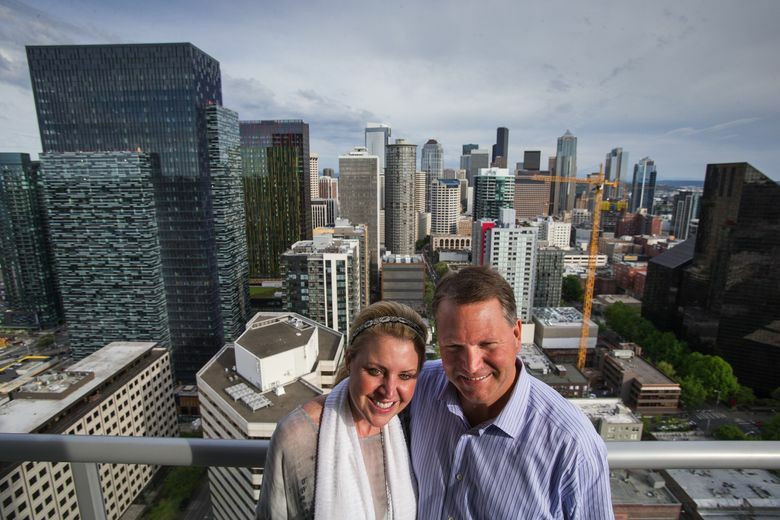 Kelley and Craig Dobbs, in their 50s, sold their 5,000-square-foot home in Sammamish and downsized into a $1 million-plus, two-bedroom condo in a luxury tower in Belltown with killer downtown views. Chris Erickson stopped paying rent last summer after he bought a two-bedroom condo in Ballard for $350,000. Now the 28-year-old feels like he’s building equity while staying close to the urban amenities he enjoys. Condos tend to attract buyers at opposite ends of the spectrum: entry-level buyers looking for low prices, or those ready to downsize from their single-family home. 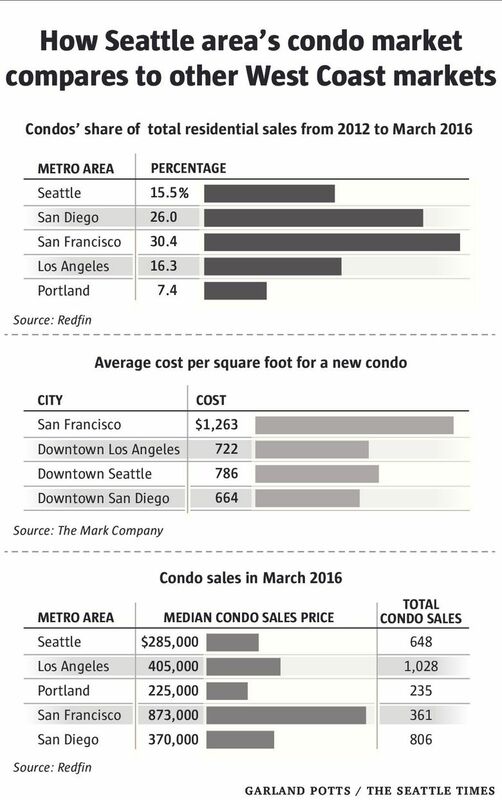 But would-be condo buyers in the metro Seattle market are finding too few available on the market. A larger selection of condos could ease demand for single-family homes, where tight supply is driving prices quickly skyward. But cumbersome state laws discourage developers from building more condos — especially at prices entry-level buyers could afford. The Dobbses took the plunge into urban living last year and bought a 1,270-square-foot unit in Insignia, where units range from $500,000 to upward of $2 million. 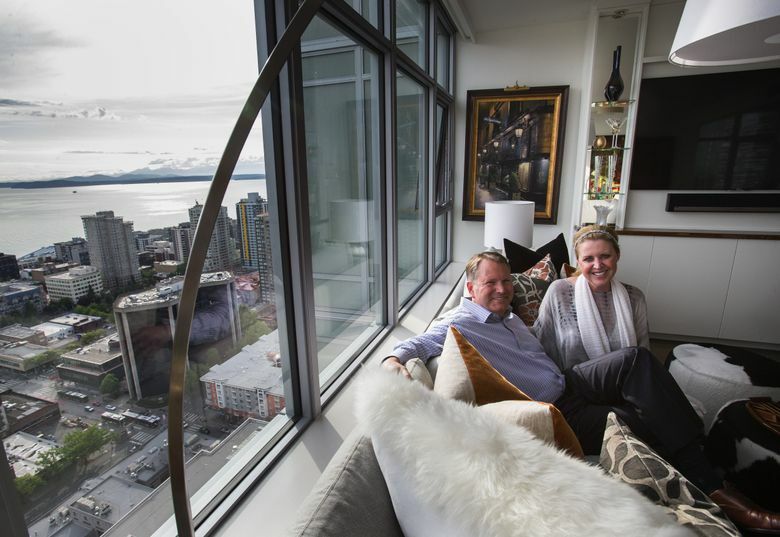 “We really fell in love with the view, the location,” said Kelley Dobbs on a recent sunny afternoon from her 34th-floor home overlooking Puget Sound. The move meant purging everything from large furniture to her grown daughters’ childhood art projects. But it put them within walking distance of dozens of restaurants, shopping, Pike Place Market and her husband’s office. They were among hundreds of people who snapped up units in Insignia before the building was even built. “We felt like if we didn’t buy a unit, we could be passed by,” Dobbs said. Housing developers say the threat of lawsuits, frequently over problems that emerge long after construction is finished, discourages banks from financing condo developments. Instead, developers have flooded Seattle, Bellevue and other nearby cities with thousands of new apartments — not the for-sale housing that buyers want. 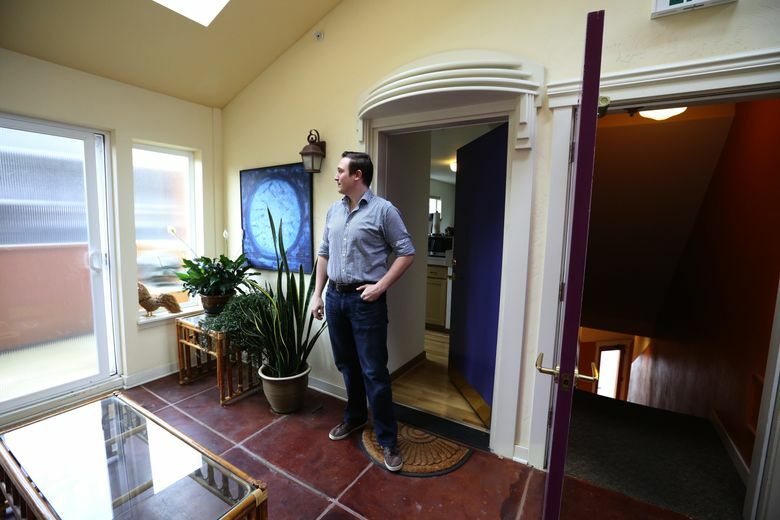 With apartment rents soaring in some neighborhoods, many renters would prefer to buy a home and lock in their housing costs, said Kyle Moss, a Redfin agent in Seattle. “We have a lot of millennials that instead of the standard house with a lawn and kids riding bikes, they would rather live in a denser area that’s more urban,” he said. He considers his purchase a smart business decision. His housing costs — including mortgage, taxes and insurance — are higher than when he was a renter. But after taking in a roommate, what he spends on housing each month is about the same as the $1,400 a month he was paying for a “tiny” one-bedroom in Capitol Hill. “Before when I was renting, it felt like my money was going into another person’s bank account. Now it feels like it’s going into my bank account,” he said, because he is building equity and anticipates that his condo will increase in value over time. On average, condos are an affordable alternative to a single-family home. In King County, the median price for a condo was $309,975 in March compared with $531,250 for a single-family home, according to the Northwest Multiple Listing Service. Still, condos represent only a fraction of the market. In March, 978 condos sold in King, Snohomish, Pierce and Kitsap counties versus 4,367 single-family houses. Prices for condos have shot up more than single-family homes in some parts of the region. In Pierce County, the median price of a condo jumped by 23.2 percent year-over-year in March to $201,500 compared with an 8.2 percent increase to $265,000 for a single-family home. Some submarkets where condo prices are heating up include Des Moines, where the median jumped by 50.4 percent year-over-year in March to $176,000. In northern King County, comprising cities such as Shoreline, Lake Forest Park and Kenmore, the median condo price leapt by 64.5 percent to $255,000. Low inventory is a problem throughout the housing market that doesn’t appear to be easing any time soon, said Svenja Gudell, chief economist at Zillow. One problem is that would-be sellers decline to list their homes if they don’t think they will find a new home to buy. A solution, Gudell said, would be to build more new housing. This year alone, developers are expected to put 7,090 new apartments on the market in Seattle and 4,058 elsewhere in King County, according to Dupre + Scott Apartment Advisors. Meanwhile, new condo development in Seattle has been limited to a few projects. Among these are the 698-unit Insignia project in Belltown that opened its first tower in 2015 and will open a second tower later this year; the 107-unit Gridiron in Pioneer Square, due for completion in 2017; and the 168-unit Luma on Capitol Hill, to open this summer. Some projects sell out well before residents start moving in. The Mark Company, a condo-marketing firm, estimated that in March, Seattle had only 264 new condo units on the market. So far, buyers have reserved 19 of Gridiron’s one and two-bedroom units priced between $400,000 and $1.3 million. The developer is releasing units in phases and will later release 12 units for low-income buyers. People don’t just want to live downtown, he continued, they also want the option of owning a home. State laws make it easy for buyers to sue developers over construction defaults to the point where almost every new development is hit with a lawsuit, Daniels said. The legal risks mean higher costs for insurance and legal fees, which can drive up the total cost of a development. Those factors not only discourage condo development, but also deter building condos priced for entry-level buyers. The laws were intended to protect consumers, Daniels said, but have gone too far and now hurt consumers by limiting housing inventory. Daniels speculates that many of the apartment developments in the works could be built as for-sale housing if the legal risks didn’t add so much to the development cost. Seattle Mayor Ed Murray included increasing condo development among his 65 recommendations for making housing more affordable in Seattle. Part of that effort involves revising the state condo law. Proposals to change the state law have failed for several years, said Peter Orser, interim director of the Runstad Center for Real Estate Studies at the University of Washington. The center plans to publish a report in July on how to best improve the law. “We thought it was important to try to understand why we don’t build as many condos as you might think, as an affordable housing opportunity,” Orser said. Most condos are built in dense areas such as Belltown, Capitol Hill and Ballard where residents are willing to pay a premium for the location and amenities. Eastside markets such as Bellevue and Kirkland, where demand for more urban living and for-sale housing is also on the rise, also have a lack of condos, said Jason Foss, a broker with Northwest Group Real Estate. To avoid the condo law’s entanglements, developers often choose to build town homes, which can be classified as single-family homes to avoid the liability issues of condos. That results in fewer units going on the market, Foss said. At Insignia, sales have been brisk since Bosa Development began selling units in mid-2013. The project on average sold one unit per day in 2015 and now has less than 10 percent of its homes left to sell. “People are realizing (the project is close to selling out) and that they better act quickly,” said Melissa Camp, an Insignia sales agent. While some new condo projects are under construction or close to starting construction, it will take years for another high-rise condo tower to hit the market. For the Dobbses, high-rise living has been a welcome change. They rarely cook at home, instead eating at nearby restaurants. They work out most mornings in the building’s gym and only use their car maybe once a week. And they don’t miss maintaining their yard or hanging up Christmas lights in the winter.